Ben Mackey signs on the dotted line for Racing Club. Racing Club Warwick have signed highly rated goalkeeper Ryan Young from Midlands League Division One rivals Studley. The 23-year-old moved to The Beehive at the start of last season after four years at Redditch Borough where he earned a place in the Midlands League Division Two team of the year for 2016/17. Racers manager Scott Easterlow was interested in signing the keeper last summer and following on from his decision not to keep Tom Cross at the club, he has finally got his man. And Young said he did not much persuading to make the switch to Townsend Meadow. “I’m absolutely delighted to be joining such a good, well-regarded and progressive club in Racing Club Warwick. “As soon as I met with Scott (Easterlow) and Tony (Clarke) my mind was made up and I wanted to join. “I was very impressed with both their, and the club’s, plans going forward. 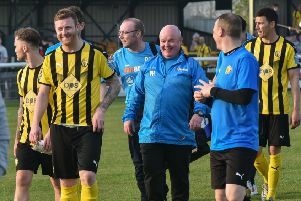 Young is Racers’ second close-season signing after former Leamington forward Ben Mackey and Easterlow said he also has two more players lined up as well as tying down eight of last season’s squad. He said: “I am delighted to have verbal commitment from the lads that the club want to keep for the new season as it ensures we have the continuity and strong starting base. There’s still a few to speak to and I am also over the moon with the quality coming in.